I met Melvin in 2012, while living in Woodbridge. He was painting houses around the alleyway at Hancock near Trumbull when I came home from work. I stopped to talk to him for a while near the bergamot flowers in front of my rental unit. I could tell then that Melvin was a special sort of person — one with a real eye for detail, and with a real heart for his community. 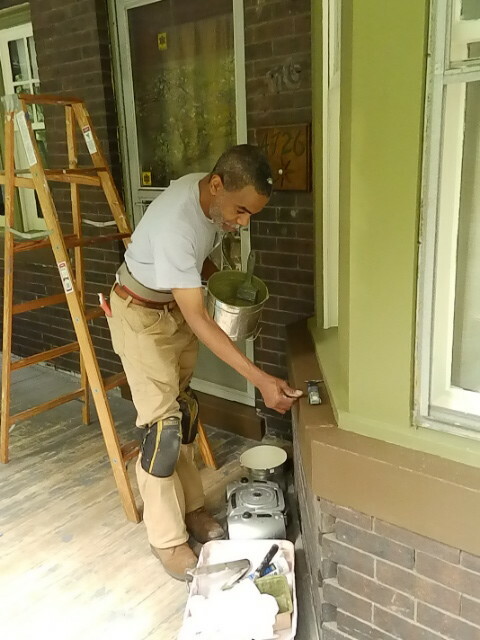 Three years later, I had a chance to meet Melvin while painting a porch on Commonwealth and my initial impression of him as a real part of the community was not only confirmed, but enhanced. Melvin was born in Berkeley, California and moved to Detroit when he was 17, and bought a house in 1981. MN: That was before Woodbridge was Woodbridge. I bought a house down here that was built in the 1800s, and I’ve been painting here for a good thirty years. The Victorian houses — that’s what I fell in love with. Because we don’t have these in California. Our houses were all Stucko; everything was screwed to the wall. This is a long phase. I’ll tell you: it took — to where this place is at now — thirty years. What you see here, this transformation. I admire it. I admire seeing different cultures. I knew this was eventually going to happen because I’d seen it in other places: Chicago, California, here in Detroit, New York — same thing. I knew this was going to come to pass, and it’s finally here. My love, it’s what you see here, the houses, the painting. I used to paint in San Francisco and we didn’t have ladders. We had scaffolds. You’d lay on your back and paint the gingerbread houses, seven, eight, twelve colors. TL: Did you go to school there? MN: I lived there. My dad’s people were from here. A lot of people from here and a lot of people down south in West Virginia. I would come up here in the summertime. My dad moved here permanently and opened up his business. I got familiar with it (Detroit) and my mom was like “You don’t want to move to Detroit. You don’t want to go there.” But, I came here and I’m glad I left. I went to Wayne State University but the reason I came was because I loved the architecture, the homes, the buildings, the structures. Most people see devastation. I see a lot of potential. I see homes that can be put back together. You may say it’s time for demo; I’m like, man, give her to me. Let me show you in a couple of months. MN: Exactly. It started in what, ’80? It started from there (points north), and worked it’s way back (points south) until you get to Grand River. It wasn’t that distance, at the time. Avery to Commonwealth, and then it extended. Now it goes beyond, which I love because, you know, the oldest neighborhood is Corktown. From my research, everything originated from the water and came back this way. TL: How long do you think before it connects to Corktown? MN: Oh yeah, and that’s what I love about it. I love the area. People come now and they’re like “blah, blah, blah,” but you had to see it before. It’s like Midtown, Cass Corridor — you didn’t want to go in there (back then). To see now, the transformation. I love that. And, everything is taking place downtown now. You have to really be into the character of the structures, the buildings. We need to protest; don’t take this building down. It’s got great potential. TL: Well, let’s not tear that down. What do you attribute that rising mentality to? MN: I think a lot of people are fighting that, and getting into the restoration part of it. You know, keep some of this. They don’t build these places like they used to. You’ll never get this. Trust me. These new homes, they would never stand the time these places stood. Never. Maybe they save more energy, but they’ll never stand the time these places have stood. TL: When did you hook up with Woodbridge Co.? MN: I met Larry about twenty-five years ago. He needed a painter and someone gave him, matter of fact I think it was the judge (points to the house next door) who gave him my name. His name was Roy Rouhlac. His transformation was in November. The house there on Hancock and Commonwealth, that was the first place I did for him — the inside and outside. Woodbridge was still going through its transformation. But that’s when he came in. I’ll tell you one thing, Larry saved a lot of these places. No one took the time that he took. I give him a lot of credit in Woodbridge, to a certain extent. Without him, a lot of these places would probably be gone. He took on challenges most people wouldn’t have taken on. He saw something that most people couldn’t see. TL: So you primarily painted? MN: I do pretty much everything when it comes to restoration, but I couldn’t do it all, so he had to get other people. And that’s how he grew, by getting recommendations from other workers — drywall guys, plaster guys, stuff like that. I always kept the painting part, because that was something I loved. I worked for Northwest Airlines for 28 years in aviation. I’d go to work and have maybe two planes in my hangar to get back on the runway. That’s what I did, but my passion was painting. That’s why I always tell everybody, have something that you truly love to do. You can always have a, I don’t mean to say ‘slave master’ job, but if that job folds what are you going to do? What is your passion? What makes you happy? It’s not about the money. It’s about what completes you. What makes me happy? I sat up for six to eight months looking up at the ceiling, saying why me? Then, the spirit said, “Why not you?” So, what makes me happy? What changes everything, even though I’m having pain, right now? What changed everything and made it subside, was getting back and doing what I want. I always tell people: that’s your Picasso. Complete it. Don’t leave it half-done. And that’s me. This is my Picasso right here (points to fresh paint on the porch). This is what I say about painting. It’s my last piece. TL: You’ve been painting for a long time.